The Conservative Party has released its first general election campaign poster of 2015, which has already been criticised for being "misleading". The poster, which says "Let's stay on the road to a stronger economy", cites various achievements of the coalition Government including halving the deficit. The claim has already been criticised as being misleading, as the figure is only true as a proportion of GDP. The poster also claims that the Conservative-Lib Dem Government has helped 1.75 million people find work, as well as creating 760,000 new businesses. The official Lib Dem press office has weighed in on Twitter, describing the Tory economic plan as "a highway to hell". 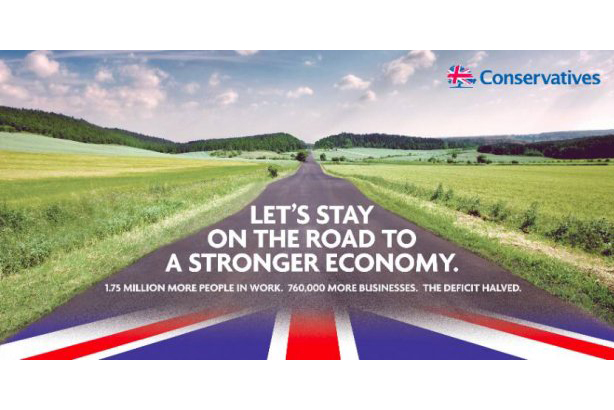 Tory poster shows green road to recovery, but their economic plan is more like a highway to hell. Only @LibDems will finish the job fairly. Thing I don't get about new Tory poster isn't the "facts" but the picture. How many voters live on a street that looks like that.